Beauty is in the eye of the beholder and what is pretty and comfortable to some, it is ugly and low class to someone else. We all have different tastes. Aren’t we told all the time that diversity is great? She declared, “Lilly Pulitzer is not fashion. It is clothes. The classic Lilly Pulitzer dress comes in shrill shades of yellow and pink that are vaguely infantilizing,” a preppy line you can see from far away, “50 paces” to be exact. I think the middle class is not interested in buying fashion, or high fashion for that matter. They want to buy clothes that are comfortable, reasonably priced, in bright colors that make the wearer happy, a Floridian casual that only the relaxed southerners can truly understand. “Anyone can work hard and save up enough cash to go out and purchase a Chanel suit or a Gucci handbag. A devoted student of Vogue can cobble together a personal style that speaks to her public identity,” the critic continued. This is the problem with rich people who live in a bubble, completely disconnected from reality. Nobody in their right mind would save cash to buy an elitist, snobby Chanel suit that is uncomfortable, tight, and impractical in an economy in which many people have a hard time paying their bills and buying decent food for their families. Most Americans do not dress according to Vogue or carry around real Gucci bags when $5,000 is better spent to help the family survive a few months. It is not true that Lilly Pulitzer represents something that “money cannot buy.” Lilly is just comfortable, relaxed, and reasonably priced everyday clothes. A buyer does not have to forgo important purchases in order to buy snooty high fashion. The preppy appeal to the college crowd is just that, floral and happy colors appropriate for someone so young who still sees the world with innocent eyes. There is nothing “one-percentish” or rarified “clubby” about the Lilly clothes. What is wrong with people on a budget buying colorful prints, creative designs, and clothes that make them happy? Is it jealousy for a successful marketing strategy? Are shoppers on a low budget not having “discerning tastes” because the Chanel-promoting one-percenters think so? Is it better to buy high-priced designer jeans with holes and rips in them? Downplaying and ridiculing the entrepreneurship of the Lilly brand and of her now-deceased founder as “a bored, rich house-wife who had started an orange juice stand in Palm Beach, Florida” is definitely not going to win any converts from the middle class to the rarified upper class of Chanel-wearing elites. There was nothing wrong with the entrepreneurial Lilly Pulitzer purchasing the fabric at Woolworth’s and having her dressmaker sew simple chemise dresses. Many American women bought their fabrics and Simplicity dress patterns at Woolworth’s and Hancock’s and then made their own clothes through the early eighties. No average American woman in her right mind is going to wear the high-end designer clothes which are not meant to cover someone’s body, they are too short, too tight, too revealing; these clothes are meant to scream to the world, look at me, I have money, I spend hundreds of thousands of dollars on my high-end fashion, I flaunt my wealth this way, and I live a life filled with expensive adornments on my body. The middle class women do not wait for a sale at Neiman Marcus; they go to Target to buy a $40 Lilly Pulitzer dress or to the flagship store for a $200 one. 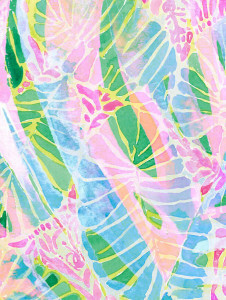 Yes, the critic is right, “Lilly Pulitzer is a classic. It is always hanging on a rack somewhere, everywhere, in all of its pineapple-print, feel-good, preppy psychedelia.” Ask any southern college girl and they will agree that a Lilly dress on a sunny football weekend is the best. Ask anybody else what they would like to wear to the beach or to a picnic and the answer is Lilly clothes. I think that most women prefer the inexpensive, feel-good, and colorful “psychedelia” of Lilly Pulitzer over the overpriced, snobby elitist “psychedelia” of ridiculous high-fashion. I personally remove the label of any clothing as it bothers my sensitive skin. We don’t wear labels to affirm who we are – we know that the handmade, “high-class promised quality” is still “stitched just so” in a couture sweat shop by Chinese hands. On that note, I am going to wear my light pink Lilly t-shirt which only set me back $40 and makes me happy to wear. Clothes do not make a person good, exceptional, or bad; they just create an illusory image and give a false impression of the wearer. We don’t need a branding or “public identity” expressed through expensive high fashion, we want to be ourselves. This entry was posted in Uncategorized and tagged clothes, critic, high fashion, Lilly Pulitzer, Target by Admin. Bookmark the permalink.